SELF-GUIDED MOTORCYCLE Tours: RIDE THESE COUNTRIES on a Budget, and as you wish! If you're excited about adventure travel in any of the regions on our website, the lowest cost, and perhaps best way of having such an international motorcycle tour is to do it Self-Guided! While we've had a blast on our Guided Group Tours with Customers, we also recognize that some travelers prefer to be alone, or within their own private group of friends. As such, we offer Self-Guided "Fly & RIDE" packages and rental opportunities. Have a look at some of the pre-packaged options below, and let us know how you want to best enjoy your motorcycle trip. At the very minimum, RIDE Adventures will always be providing you with a properly-maintained, late model motorcycle, and the necessary paperwork, authorizations, and insurance for crossing international borders. Part of our service is also answering your questions about which of these routes you would enjoy the most, so Contact Us via the form shown, and let us know: What would make the perfect international adventure for you? Learn more about our motorcycle tours. Self-Guided Tour: "Fly & Ride Patagonia, Tierra del Fuego, & Ushuaia!" SELF GUIDED "FLY & RIDE" PACKAGES: This page and pricing is for your own Self-Guided tour package, and is customized to your date preferences. PLEASE NOTE: Our Patagonia motorcycle rental availability is limited, and some dates can be sold out 6-8+ months in advance. To get your trip package reserved while bikes are available, please contact us with your requested dates and bike choice. Once your reservation is set, just show up, and RIDE! SELF GUIDED "FLY & RIDE" PACKAGES: This page and pricing shown is for your own Self-Guided tour package. As such, you can start this package on any date that you've reserved our available motorcycles and hotels for! When you're ready, we just need to know what your arrival date would be in Pucón, Chile (ZCO airport) which motorcycle you want to ride, and how many people you are coming with. Once the reservation is set, just show up, and RIDE! 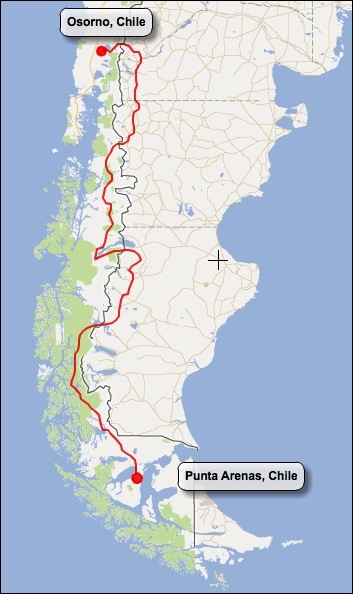 SELF-GUIDED, TRUCK SUPPORTED TOUR: "Full Patagonia Adventure"
PICK YOUR PRIVATE GROUP DATE: Anytime! SELF GUIDED "FLY & RIDE" PACKAGES: This page and pricing shown is for your own Self-Guided tour package. As such, you can start this package on any date that you've reserved our available motorcycles and hotels for! When you're ready, we just need to know what your arrival date would be in Osorno, Chile (ZOS airport) which motorcycle you want to ride, and how many people you are coming with. Once the reservation is set, just show up with your riding gear and personal documents, and RIDE! PICK YOUR PRIVATE GROUP DATE: Anytime we have availability! PRIVATE GROUPS: *Please see our Private Group Tours explanation page, and let us know when you want to explore Colombia! CONTACT US: Whenever you want to go! Self-Guided Tour: "Fly & RIDE The Southern Africa Experience"
SELF GUIDED "FLY & RIDE" PACKAGES: This page and pricing shown is for your own Self-Guided tour package. As such, you can start this package on any date that you've reserved our available motorcycles and hotels for! When you're ready, we just need to know what your arrival date would be in Windhoek, Nambia (WDH Aiport) which motorcycle you want to ride, and how many people you are coming with. Once the reservation is set, just show up, and RIDE! Self-Guided Motorcycle Trip Package: "Fly & RIDE Peru & Machu Picchu"
SELF GUIDED "FLY & RIDE" PACKAGES: This page and pricing shown is for your own Self-Guided tour package. As such, you can start this package on any date that you've reserved our available motorcycle and hotel package for! When you're ready, we just need to know what your arrival date, where you want to start and finish, which motorcycle you want to ride, and how many people you are coming with. Once the reservation is set, just show up, and RIDE! Self-Guided Tour: "Fly & Ride the 3 Corners: Argentina, Bolivia & Chile"
SELF GUIDED "FLY & RIDE" PACKAGES: This page and pricing shown is for your own Self-Guided tour package. As such, you can start this package on any date that you've reserved our available motorcycles and hotels for! When you're ready, we just need to know what your arrival date would be in Antofagasta, Chile (ANF airport) which motorcycle you want to ride, and how many people you are coming with. Once the reservation is set, just show up, and RIDE! Guided or Self-Guided Tour: "Patagonia, Coast to Coast"
Pick Your Date for a Custom & Private Group Tour! SELF GUIDED "FLY & RIDE" PACKAGES: This page and pricing shown is for your own Self-Guided tour package. As such, you can start this package on any date that you've reserved our available motorcycles and hotels for! When you're ready, we just need to know what your arrival date, where you want to start and finish, which motorcycle you want to ride, and how many people you are coming with. Once the reservation is set, just show up, and RIDE! One of the World's Most Expensive Hobbies (motorcycle riding) demands that we're careful with spending when possible. So if you're looking to save money, but still experience the great motorcycle trip opportunities we promote, why not just reserve one of our motorcycles and follow an itinerary we put together for you? This "Do It Yourself" approach in some cases means you'll spend about half of what the guided tours cost, and perhaps add that certain sense of satisfaction that comes with the "Lone Wolf" spirit of adventure. With helpful services from RIDE Adventures, this is actually quite easy to accomplish. Step 1: Decide what type of terrain, surroundings, scenery and cultural experiences you're interested in or specifically which country(s) you want to RIDE in. Trust us as the experts when it comes to saying how long it takes to ride each region. Collectively, we have hundreds of thousands of kilometers of riding experience, and we know how long each route takes in all the countries on www.rideadv.com. Keeping in mind that we want you to see the most exciting and beautiful routes and scenery, don't be surprised if some tour routes keep you at an average of 150miles (240km) per day in some regions. We'll encourage you to check out the rarest and most unique spots if you're up for it! Plan on having 1 "rest day" every 3-4 days. Trust us, international riding and the people you meet along the way will be exhilerating, but potentially tiring as well! Step 3: Be prepared to answer our questions about what else you want included, for example, printed notes and turn-by-turn directions, hotel reservation packages, or anything else. We know, the services you want included will probably depend on the prices, but we'll get to that once we know more about what you want. Step 4: Our communications with you will make it easy to explain an exact cost based on the services you'd like included, and again, we can help you make sure you're doing this as low-cost as possible. Step 5: Reserve everything through RIDE Adventures right here in the U.S.! Possible Rest Day Activities: Rafting, Fly-Fishing, Canopy Tours, Boat Trips to the Marble Caves, Hiking, Horseback Riding, Argentine Wine, Chilean Beer, Watching the Sunset, and Relaxation! Example Self-Guided Trip Packages: See "The Patagonia Experience" or "The Best of Northern Patagonia"